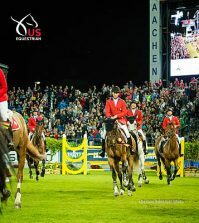 23 July 2017, Aachen, Germany – The first equestrian Major of the year has been won by Belgium’s Gregory Wathelet riding Coree, thrilling the 40,000 capacity crowds in the main arena at CHIO Aachen in a dramatic jump off. 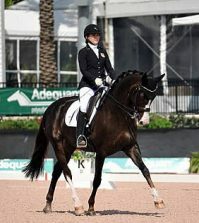 Portugal’s Luciana Diniz riding Fit for Fun 13 was second and The Netherlands’ Marc Houtzager riding Sterrehof’s Calimero took third place. 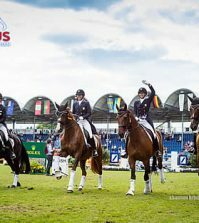 A cool, overcast day welcomed the 40 horse and rider combinations who had qualified for the Rolex Grand Prix on Sunday 23 July, the finale and highlight of the nine-day World Equestrian Festival in West Germany. As one of the four Majors which make up the Rolex Grand Slam of Show Jumping, every rider had travelled here with one aim: to win in one of the sport’s greatest outdoor arenas. 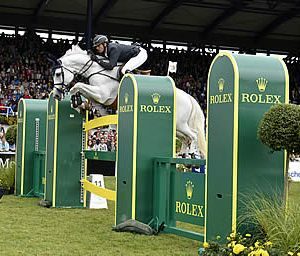 The Rolex Grand Prix course, designed by the notoriously demanding Frank Rothenberger asked these world class pairings continuous questions over the first round, with 16 jumping efforts to tackle. Rolex Testimonee Scott Brash was third to go and despite a seemingly faultless start, the penultimate triple combination saw Brash take an unlucky four faults. Testament to the difficulty of the course, only seven clear rounds were produced within the time, including a foot perfect round from Canadian Olympic 2016 bronze medallist and Rolex Testimonee, Eric Lamaze. Two seconds faster than the rest of the field; he had set the bar high for the second round. 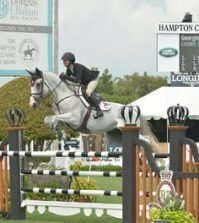 18 riders progressed through to round two, with Scott Brash and Eric Lamaze joined by fellow Rolex Testimonees Kent Farrington and Meredith Michaels-Beerbaum, both of whom carried four faults from the first round. The course was altered for the second stage of the competition: a revised track of 15 jumping efforts tested each horse and rider combination, requiring utmost accuracy and precision to leave the poles standing. Clear rounds were easier to come by and after Luciana Diniz of Portugal followed Marc Houtzager by posting the second double clear, the crowd knew it was going to be treated to a jump-off. Gregory Wathelet of Belgium and Laura Kraut of the USA followed suit, taking the final round to four competitors. Despite recording the fastest first round ride, Rolex Testimonee Eric Lamaze had an unlucky four faults, taking him out of contention of winning the Rolex Grand Prix. First to go in the jump off was Marc Houtzager, posting a clear round with a time of 53.66 seconds, but this was quickly beaten as Luciana Diniz raced around the course in 47.40 seconds. With two riders left to go, a hushed silence descended over the crowd as Wathelet entered the arena aboard his mare Coree. The pair turned up the pressure and took another second off the fastest recorded time, finishing on 46.60. The cheering crowd once again quietened as the last rider to go, Laura Kraut, entered the arena. Unfortunately, luck is not always on your side in this sport and Kraut knocked the last rail, dropping her into fourth place, giving Wathelet the title spot. Along with the prestigious Rolex Grand Slam of Show Jumping trophy, Wathelet also received an engraved Oyster Perpetual Datejust II. All eyes will now be looking ahead to the next equestrian Major at the CSIO Spruce Meadows ‘Masters’ in September, where Wathelet will be attempting to continue his reign as the live contender of the Rolex Grand Slam of Show Jumping.